Many of the services we offer to clients are similar to what other financial advisors provide. However, we take a look at one aspect most advisors rarely do—taxes. At Affinity, our distinctly unique approach to investment management and financial planning is centered on strategies that create potentially tax-free investments and efficient distribution of income in retirement. This specialized focus puts us in the position to work with and advise individuals—even those who already have an advisor without affecting their current relationship. If a majority of your money is in retirement plans (401(k)s or IRAs), then your income at retirement time is taxable. Our attention to critical tax strategies helps our clients prepare to have some money tax-free at retirement time, further protecting more of what they’ve earned for a lifetime and beyond. A portfolio isn’t complete until all of the pieces have been designed to fit properly in place to create the most effective wealth accumulation strategy for each individual. At Affinity Asset Management, we tailor a mix of investments to build solutions that meet clients’ specific needs. As an independent financial advisory firm, we are able to offer many options that some clients might not otherwise have. We work for the client, and not a company, which means more product choices for you! We evaluate a client’s risk tolerance to help customize the portfolio design and actively manage it using models and investment analyses. We constantly evaluate historical performance and product quality to manage clients’ assets over time, with the goal of maximizing returns while minimizing risk. Additionally, we constantly monitor changes in the market and how they affect individuals’ needs long term. We believe it is important to have a blueprint or design before focusing on the details. We spend time working each client’s individual blueprint and help design strategies to meet goals and expectations. After working to identify any gap between clients’ current financial pictures and the financial future they desire, we work with individuals and businesses alike to create strategies that preserve and grow wealth. From initial preparation to ongoing planning, we maintain plans individually tailored to meet clients’ needs. We have learned that the fastest way to help create a workable plan is to focus on smart retirement strategies, not aggressive investment selection. We look to increase income while decreasing taxes, taking income from the most tax-advantaged account(s) and rearranging the pieces of each client’s retirement puzzle for the best possible outcome. From maximizing retirement income to leaving a legacy for children and grandchildren, we provide workable solutions for securing clients’ financial dreams. Many retirees and pre-retirees today are concerned with the income they will have available in retirement. The number one concern that we hear from clients is the fear of running out of money. We work diligently to get to know each client’s financial situation, goals and objectives to reduce these concerns. We focus on income strategies in combination with retirement planning and products, rather than just the products alone. When clients withdraw money to cover living expenses, they aren’t helping their accounts in fact, they may be hurting them just taking the withdrawal. Our goal is to design income strategies that hurt clients’ portfolios the least and make their money last longer. Selecting the right strategies and products is just one part of securing clients’ financial futures. Comprehensive preparation requires that we review, audit and develop the necessary paperwork to ensure what clients intend to happen actually does. Affinity Asset Management can refer you to the right estate planning attorney to provide guidance on probate laws, wills and trusts, health care proxies and powers of attorney. The attorney can assist clients with organizing and filing the proper legal documents to ensure the most tax-advantaged handling of their details. We plan accordingly so that clients’ assets are distributed to their heirs, charities and other beneficiaries as they desire. Additionally, we verify that beneficiary designations on the products clients own coordinate with language in their estate documents. It’s imperative to consider every part of your financial picture when mapping out the road to retirement. We work with clients to take a look at where their current strategies will lead, and offer solutions that might create a more positive retirement picture than the one currently in place. Affinity Asset Management can help you properly balance the mix of investments to save on taxes over time and make your money work as efficiently as possible. We consider the advantages and drawbacks to using three distinct types of accounts with different tax consequences (tax-deferred, taxable and tax-free*) to develop the right distribution for the individual and his/her circumstances. The more money we can save clients in taxes the more money they will have to achieve their retirement goals. The potential need for long-term care services is a crucial piece of the puzzle when preparing for the future. Long-term care coverage goes beyond medical and nursing care to include assistance in a variety of areas if a client cannot care for himself or herself for an extended period of time. It is imperative clients consider planning for the unknown. Medicare may meet certain health care and retirement needs for clients, but provides limited coverage if a long-term need arises. Affinity Asset Management evaluates a variety of options for clients to minimize risk and cover expenses required to meet any long-term care needs. We offer products and services to help clients protect themselves, their families and their futures. We’ll analyze the impact that disability could have on clients to determine how it could affect their overall financial picture. The decision to include life and disability insurance in their portfolios can provide clients with peace of mind. These products can also help clients reduce taxes while creating more secure retirement and estate plans. From term, universal and variable life to long-term disability, Affinity Asset Management works with a variety of carriers to choose just the right product or products to fulfill their personal needs. A review of clients’ tax returns offers us the ability to uncover financial planning opportunities for improving their overall financial picture. Affinity Asset Management can refer you to a tax preparer that provides comprehensive tax planning and preparation services. We make it easy for clients, offering a one stop shop when it comes to their finances. 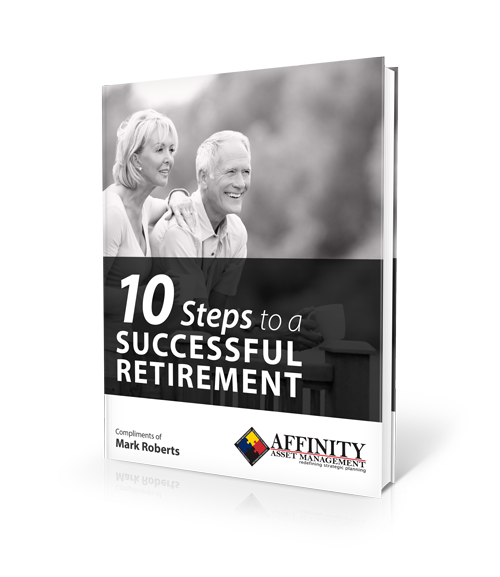 Download our no obligation, complimentary guide, “10 Steps to a Successful Retirement”, to help begin asking some very important questions regarding your retirement income. The Veterans Administration Non-Service Connect Disability Pension is designed to provide qualified veterans and their surviving spouses with a tax free pension. Affinity Asset Management along with their Veterans Advocate partners are helping veterans and their surviving spouses navigate through the complicated and often exasperating process of applying for and maintaining their Non-Service Connected Benefits. We provide this invaluable service to families on a volunteer basis, absolutely free of charge.